As of Friday, the blaze south of Spanish Fork grew to more than 106 square miles (274 sq. kilometers). Authorities ordered evacuations in three communities. Spanish Fork is about 50 miles (81 kilometers) south of Salt Lake City. 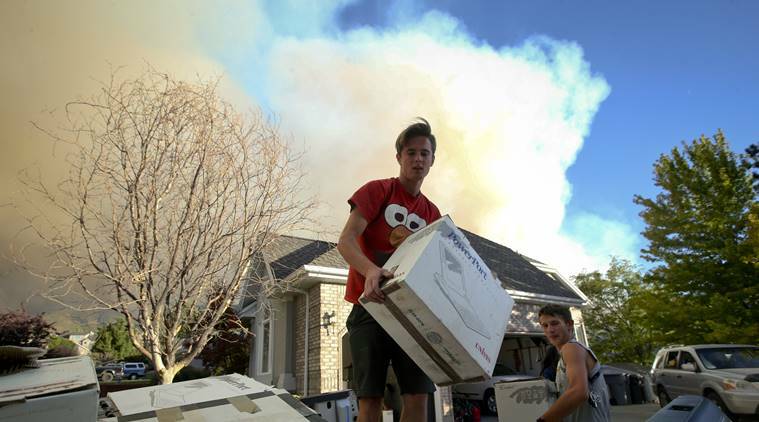 Spanish Fork: A raging Utah wildfire driven by high winds in dry terrain has the potential to decimate hundreds of homes if firefighters cannot get a handle on it in the next couple of days, the governor said Friday. Gov. Gary Herbert, who spoke at the fairgrounds in Spanish Fork after getting a briefing from fire officials, said the terrain, visibility and wind are making things difficult. “Boy, if you’ve got any sway with the man upstairs, let’s see what we can do to help with the weather,” Herbert said. No homes have been reported damaged. More than 430 personnel are working on the fire. But, according to Herbert, that figure will balloon to at least 1,000 as more aircraft, helicopters and ground resources get into place. A Type 1 incident management team is already present. Aircraft were set to drop retardant and water on the fire earlier in the day, said US Forest Service spokeswoman Suzie Tenhagen. “Their main focus today is protecting those folks’ homes,” she said. Herbert said the situation remains difficult as long as firefighters don’t have a perimeter established around the fire. Lorene Miller told KUTV that she’s lived in the small community of Woodland Hills for 12 years and it was the first time she had to leave her home. She loaded up her kids’ baby pictures and videos and fled when authorities raised the alarm. “There’s nothing we can do about it but pray, I guess,” said Miller, one of hundreds who took refuge at a high-school evacuation center. The hot, windy weather that has created tinderbox conditions in the area is expected to continue into the weekend. The fire is also threatening to converge with a second, smaller fire. Sparked by lightning in a forested, rough terrain on Sept. 6, the fire raged out of control amid high winds and was only 2 percent contained Friday. The fire has also forced road closures, including US Highway 89. Several school sporting events were canceled or moved due to wildfire smoke. Forest managers said they decided to contain the fire and let it burn in a remote area to protect firefighters and boost habitat in the area where wildfires are part of the ecosystem. Utah Lt. Gov. Spencer Cox, a Republican, criticized that decision made during drought conditions, calling it “inept decision making” in a tweet. Herbert said there will be time to analyze the situation later. “I think there’s things that can be done better but it’s not time to finger-point today,” Herbert said. In Montana, Gallatin County officials said Thursday that a smaller fire about 40 miles (64 kilometers) northwest of Bozeman burned three houses earlier this week, as well as two “secondary residences” and seven outbuildings. The structures were all damaged Monday near the community of Clarkston, which is along the Missouri River. The 2-square-mile (5-square-kilometer) fire chewing through grass and juniper was 33 per cent contained Friday morning. The cause of it has not been determined.